Marbella Lakes consists of many styles of homes and condos ranging from 1,534 to 3,269 s.f. of living space under air. Both single story and two story homes can be found throughout the community. 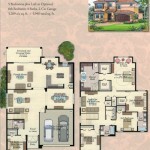 Links to floor plans of the many home models are shown below. These floor plan images were taken from original GL Homes brochures & documents used for the marketing of the Marbella Lakes community. The Floor Plans are PDF documents and require the Adobe PDF Reader to view or print. If you computer does not have the reader installed you can download it FREE here.